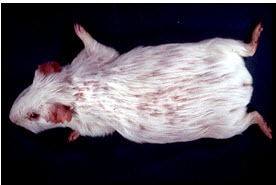 Etiology: Trichophyton mentagrophytes is the most common dermatophyte isolated from guinea pigs. Incidence: Prevalence of arthrospore carriage is quite high, though clinical disease is rarely seen. Transmission: Transmission occurs by direct contact with the spores. Young, aged, pregnant, and otherwise stressed animals are most susceptible to the disease. Clinical signs: Lesions consist of irregular alopecia with occasional crusts and broken hair shafts. Progression of lesions occurs from the nose to limbs and back. Severe lesions may become secondarily infected with bacteria. Diagnosis: Diagnosis is based upon clinical signs and identification of the fungus on KOH cleared preps from inoculated dermatophyte test medium (DTM). Public Health Significance: T. mentagrophytes has been reported to spread by contact and fomites from animal to animal and from animal to man.